If you're one of the millions of fans who watched Star Wars: The Force Awakens at theaters this past weekend, you know that a key death scene serves as an action centerpiece, as the thrilling third act comes to its rousing end. But it wasn't always supposed to be that way. We will be talking about some Major SPOILERS in this story. So if you don't want to know anymore, then turn away now. Still here? Okay, get this. While Harrison Ford's Han Solo was originally supposed to survive and reunite with General Leia, this meant another key figure in the plot had to meet his untimely demise. And that character was none other than ace X-Wing pilot Poe Dameron. But Poe's life was spared, and Oscar Isaac will live to see another sequel. 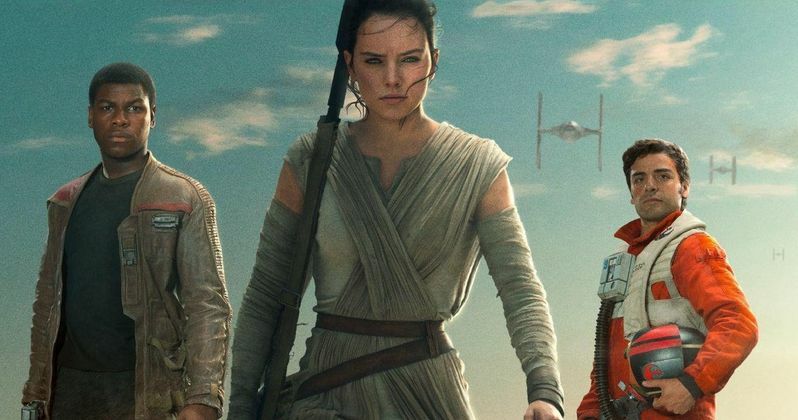 In the months leading up to the production start on The Force Awakens, the script was furiously being worked on first by Michael Arndt, and then by director J.J. Abrams and Lawrence Kasdan. As we've heard today, the script went through a variety of different alterations. And at one point, Luke Skywalker was the main character. But as things progressed, some huge changes were made. And this included a few individuals' fates. J.J. Abrams originally wanted one of his new heroes to meet their maker. But as things began to take shape, he changed his mind. Speaking with GQ, Oscar Isaac revealed that it was his character who'd been marked for death. The actor recalled his meeting with J.J. Abrams and LucasFilm head honcho Kathleen Kennedy, where they pitched Poe Dameron to him. Isaac was excited that his character sets this new storyline in motion, but he was less than thrilled about the pilot's outcome in life. J.J. Abrams initillay thought that Poe could be set up in the movie, and even though he wouldn't make it to end credits, he'd still play a major role in other upcoming Star Wars media, including books, comics and video games. While it seemed that the Poe character would have a healthy life in the canon, Oscar Isaac remained hesitant about signing on. After considering the idea for quite some time, he decided to take the job, believing it to just be a glorified cameo. But when they would meet again to further discuss the movie, J.J. Abrams surprised Isaac with a reworked script where Dameron actually lives. And not only that, he became a more integral part of the plot. From the sounds of it, Poe was supposed to die during the opening scene of the movie, after he safely gets the missing portion of the Jedi Temple map locked inside BB-8 and sends the droid on his way. The meeting with Lor San Tekka, played by Max von Sydow, was changed considerably. And instead of Kylo Ren and his army of Stormtroopers killing Dameron during their raid, they now capture him and take him to the Starkiller base. This also sets up a daring escape featuring both Poe and Finn tat wasn't in that first draft. Since it's release last week, Poe Dameron has become one of the new fan-favorite characters. And it surely would have been disappointing to see him die. But we must remember, in that version of the script, Han Solo lived. Poe is an instantly likable rogue, and is seen as Solo's successor of sorts. We're sure to see more of Poe in Star Wars: Episode VIII. What do you think? Would you have rather seen him die over Han? Or are you happy with the way things played out?